Update: On Wednesday, April 23rd, Alexis Alriche turned himself in to the Dover Police Department at approximately 4:30PM accompanied by his attorney. Alriche was arraigned in the Justice of the Peace Court #7 and was released after posting $6,000 secured bond on two charges. Original Narrative: The Dover Police Department is seeking a suspect in a Monday morning domestic related shooting. The female victim responded to the Dover Police Department at approximately 12:20PM. 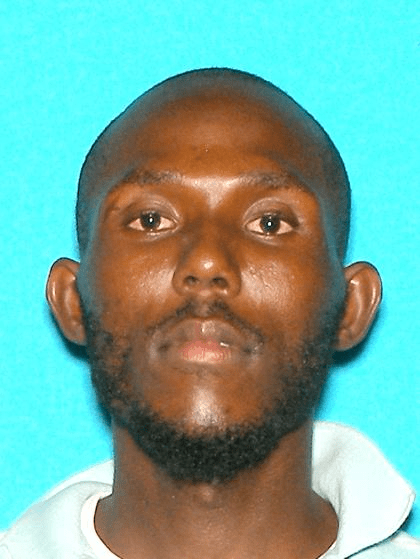 She advised detectives that she was involved in a verbal altercation with her boyfriend, Alexis Alriche (28) outside of the 100 Building of Clearfield Apartments, located on Haman Drive. During the altercation, Alriche displayed a semi-automatic handgun and fired three shots towards the female victim, nearly striking her. Alexis Alriche is described as a 28 year old black male, Haitian descent, 6’00” and a thin build. A photo of him is shown below. Alriche fled the scene in a tan Buick LeSabre with temporary DE tags and tinted windows. Alriche also has an address on file at Clearfield Apartments where the shooting occurred. Anyone with any information about the incident should contact the Dover Police Department at 302-736-7111. You may also submit an anonymous tip with Delaware Crime Stoppers by phone at: 1-800-847-3333 or online at: http://delaware.crimestoppersweb.com.